As a bodyworker and personal trainer one of the most frequent concerns I encounter is low back tension and pain. We can reduce and prevent discomfort commonly found in lumbar and hip musculature by utilizing a few basic tools to bring the body into balance. These cool down movements emphasize ankle/ hip mobility and knee/ lumbar stability with hip, torso/ trunk and shoulder integration. They can be done at the end of any workout to help bring the body into an optimal state. In all of the following movements there should be a feeling of simultaneous upward elongation from the vertex of the head and downward pull of the pelvis coupled with diaphragmatic breathing. Shoulders should be relaxed, and the pelvis imagined as a bowl that does not spill too far forward nor backward. Hold stretches for at least 20-30 seconds each side. Stand in a split stance by placing one foot forward (weight on heel, toes for balance), and the other foot back (weight on the ball of this foot). Sink downward, bend both knees to ~90o. Push through the heel of the rear leg toward the ground to stretch the calf and rotate the torso away from the rear leg to accentuate a stretch in the hip flexors and spinal rotators. Maintain an upright posture. Hip flexors: Iliopsoas, rectus femoris. Hip external rotators: piriformis; gluteus maximus, and abductors; internal and external obliques. 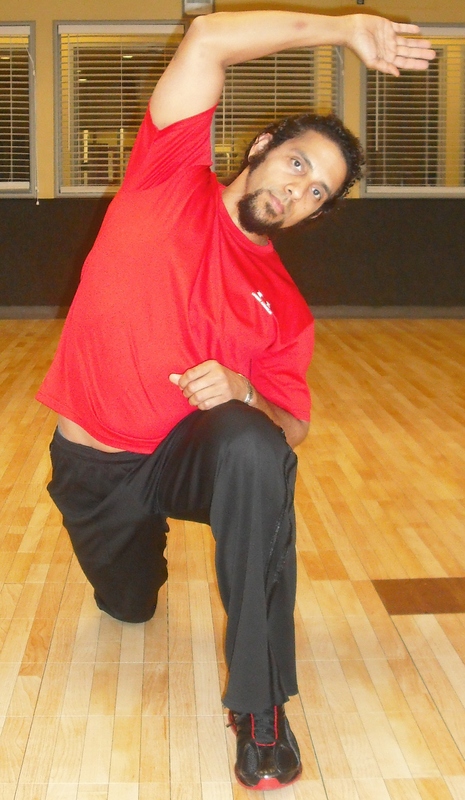 From the lunge position (left leg forward) sink downward and kneel with the right leg, dorsiflexing the right foot & pointing the ball of the foot into the ground. Both knees should be flexed to ~90°. Reach the right arm overhead and laterally flex the torso to the left to stretch the quadratus lumborum (QL), obliques and intercostals. Variation: Squeeze your glutes and slowly extend the spine. Lift the arm up and back on the kneeling side. The psoas benefits here as it is the only muscle that directly attaches the femur to the spine. Stand with feet slightly wider than shoulder width. 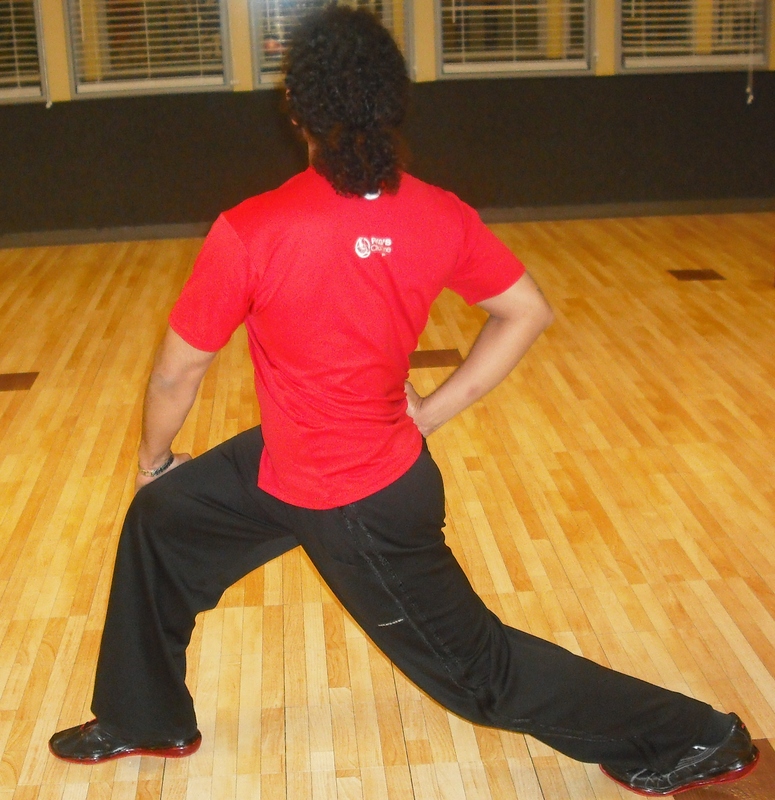 Flex forward at the hip and grasp the lower left leg with the right hand. Simultaneously pull the right hip away from the left leg. In addition to stretching the QL and hamstrings, this stretch helps to normalize the latissimus dorsi. The lats can simultaneously pull the pelvis anteriorly and the humerus medially when overactive due to their direct connection from the humerus to the spine. Using a foam roller, tennis or lacross ball can easily influence two areas that are difficult to stretch. Find and hold 1-2 tender points for a minimum of 20 seconds or until they dissipate by ~75%. Breathe normally. Avoid rolling over bones and joints. 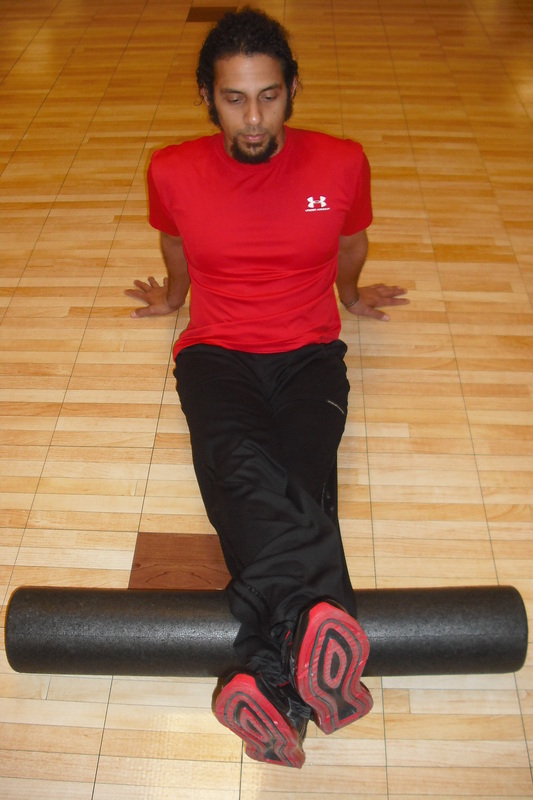 Lie on your side with your hip on top and perpendicular to the foam roller. Bottom leg should be straight with the ankle dorsiflexed. Cross your top leg over and in front of your bottom leg, placing your foot on the floor for support and control. Roll from your hip to your knee. The IT band shares fascial attachments with the tensor fasciae latae (TFL), gluteals, vastus lateralis, semitendinosus and peroneals. Sit on the floor with your calves resting on the foam roller. Roll from your Achilles tendon to the back of your knee, internally and externally rotating the lower leg to find tight or tender spots. To increase the pressure on these spots, rest one leg over the other. The calves share a fascial connection that starts at the ball of the feet and travels upward and parallel with the spine to the forehead, affecting all muscles in that path. Other common areas that would benefit from SMR include the latissimus, TFL, quadriceps, adductors, peroneals and plantar fascia. Now that you have has slowed down enough. Assume a relaxed stance with feet slightly wider than shoulder width. Allow the body’s weight to distribute evenly between the balls of the feet and heels. Relax the thighs and hips. Sitting or laying still is also an option. Breathe diaphragmatically, allowing the lungs expand and descend toward the pelvic floor and lumbar area. Simultaneously release the shoulders and elongate the spine. Diaphragmatic breathing facilitates decompression of the entire spine and increases circulation to the intervertebral discs. Previous postThe Time is Now!